Pop. 151. In Denbigh T., Lennox & Addington c., on Hwys. 28 & 41,61 km NE of Bancroft. The area was settled in the 1850s and first called Cedar Lake Settlement. Pop. 47. 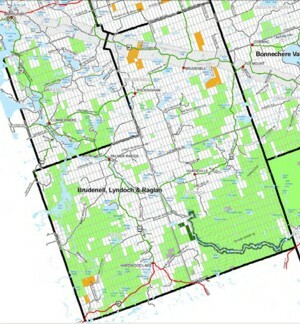 In Abinger T., Lennox and Addington Cs., 4 km SE of Hwy 41, 63 km N of Kaladar. The name was approved in 1952 by the Canadian Board of Geographic Names, but the origin of the name has not been recorded.